A view from Fort Beauséjour, a historic site overlooking the dikelands just outside Sackville, N.B. Much of the surrounding area is protected from flooding by grassy, earthen berms that hold back the Bay of Fundy. Failure of these already obsolete dikes could flood much of Sackville – an increasingly likely scenario as sea levels rise. Lorne Street in downtown Sackville, N.B., is a forlorn place. White paint peels from the century-old building housing the Tantramar Seniors’ College. The Legion’s red neon “Open” sign was among the few signs of human activity one grey August afternoon. Ground-floor windows of neighbouring buildings were shuttered. The Kookie Kutter Bakery, painted two flaking shades of fading red, was alone in displaying signs of activity. Derelict automobiles, many of them smashed and twisted, rusted near several towing company vehicles. The sign on a weathered, wood-shingled building was so faded it was hard to make out the letters: Bowser’s X-mas Trees. It’s tempting to chalk up the blight on this otherwise attractive town to the same dismal trends – aging populations, out-migration – afflicting many small Maritime communities. But Lorne Street’s real problem is to be found on topographical maps: It lies below sea level, and on a floodplain. Town bylaws now restrict what new buildings can be constructed here, and only the municipal government is interested in making upgrades. A drainage ditch alongside Sackville's low-lying Lorne Street. The town is upgrading storm sewers beneath the street to cope with freshwater flooding. But the area is also increasingly vulnerable to inundation from the Bay of Fundy as sea levels rise. Their town is ringed by more than 30 kilometres of grassy, earthen berms that hold back the Bay of Fundy. They cannot be seen from town, making them invisible to visitors and out of mind for residents, yet life here depends on them. Immediately east lies the floodplain of the Tantramar River, much of which would revert to tidal salt marshes if seawater pushed inland and the dikes failed. Sackville stands to lose far more than desolate Lorne Street if that happens: many homes and businesses also lie in the floodplain. “There is a fairly significant area of Sackville that would literally be underwater if there was a breach,” town engineer Dwayne Acton said. So would the Trans-Canada Highway and the CN Rail line, which run through Sackville and across the Tantramar floodplain. According to a 2009 estimate, flooding on this crucial transportation corridor could interrupt trade worth more than $50-million a day – and cut Nova Scotia off from the rest of the country. So it’s unfortunate that those dikes were constructed long before rising sea levels became the subject of dinnertime conversation. They are incapable of withstanding tomorrow’s floods. It’s doubtful whether they can handle today’s. Claude Robichaud is acutely aware of all this. For nearly two decades, he has served as the manager of a group of eight provincial employees charged with maintaining the province’s 100 kilometres of dikes, most of which meander through the Sackville area. (Nova Scotia has an additional 250 kilometres along the Fundy coast.) Standing atop a dike at the Aulac River, just outside Sackville, he pointed to the cars and trucks whipping by on the Trans-Canada Highway. The road was visibly lower than the vantage point. “So basically, if this dike weren’t here, the water would go over the highway,” he said. 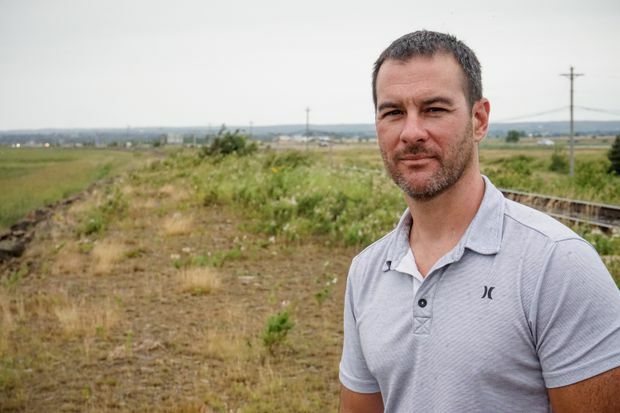 Claude Robichaud, shown standing on a dike just outside Sackville, N.B., and his team are in charge of maintaining New Brunswick's network of dikes. Nothing like that has happened in living memory. But it becomes more probable with each passing year. With the town expecting the Bay of Fundy to rise an additional metre by 2100, the dikes are decidedly obsolete. Various levels of government are considering how to erect new defences. It remains to be seen what those barriers will look like, who will be willing to pay for them and whether they will be complete when the next superstorm blows through and pushes the water levels over-top. The Fundy dikes have witnessed protracted periods of decline and neglect, punctuated by occasional meteorological reminders of what’s at stake. French colonists built the earliest around 1640 near present-day Annapolis Royal, N.S. Using crude tools such as narrow diking spades, Acadians piled marsh muds into earthen dams, covered them with grassy sods and converted the Tantramar marshes into fields and pastures. They established new farming communities along the Fundy shore using the same techniques. The first was Beaubassin, between present-day Sackville and nearby Amherst, N.S. After the Acadians’ expulsion by British authorities in the 1750s, the dikelands lay idle and neglected. In 1759, a storm breached the Fundy dikes, flooding extensive areas. Incoming New Englanders and English, German and Irish settlers spent years redraining it. The Bay of Fundy’s massive tides – among the world’s highest – swing as much as 16 metres. That reduces the risk of catastrophic flooding, because high tide never lasts long before retreating a safe distance. Even so, the mathematics of probability dictate that every once in a while, storms will arrive during extraordinarily high tides and push the waters higher. And when that has happened, locals often had cause to wish their forebears had piled the earth just a little higher and made the dikes a little stronger. The mother of all local storms, the Saxby Gale of 1869, overwhelmed the dikes. Modern estimates suggest the storm surge rose about two metres above the highest recorded tides, over-topping dikes by nearly one metre. Newspapers throughout the Fundy region reported numerous breaches, extensive flooding, wrecked bridges, barns and fences, ruined haystacks, drowned horses, sheep, cattle and people. Remnants of old Acadian dikes can still be found. But the berms protecting Sackville today date from the mid-20th century, the last period during which the area faced a major infrastructure crisis. The dikes went into terminal decline after hay prices collapsed during the 1920s and landowners could no longer afford to maintain them, and the sea had already reclaimed hundreds of hectares of farmland. Ottawa and the provincial governments established the Maritime Marshlands Rehabilitation Agency (MMRA) in 1949. Its staff of 75 began surveying to determine ideal sites for new dikes, explored which grasses would best protect their slopes and considered how modern machinery might be put to work on the slippery marshland mud. Sometimes built directly atop old Acadian dikes, the new ones were huge by comparison. They boasted about a metre of “freeboard” (the distance between the high-tide mark and the top of the dike), meaning that even during unusually high tides, the dike would remain comfortably above sea level. The federal government handed this new infrastructure over to Nova Scotia’s and New Brunswick’s agriculture departments in the 1970s. “The dikelands are universally well-protected,” boasted a book the government of Nova Scotia published in 1987. They are, at least, well-maintained. Every year, from May through December, Mr. Robichaud’s team surveys the dikes. They mow grasses to prevent larger vegetation from establishing itself. (Trees and other large-rooted plants can degrade dike integrity, as can burrowing animals.) They patch areas eroded by the sea and meandering rivers. For years, the provincial agriculture department set aside an annual budget of $400,000 for this work. “We’ve been topping dikes along there in Sackville, attacking those that have been easiest to do,” he said. The problem is that the Bay of Fundy creeps millimetres higher each year. Citing tide gauge data from nearby Saint John, the Nova Scotia Community College’s Applied Geomatics Research Group calculated the Bay of Fundy’s level has risen 22 centimetres a century. The dikes, meanwhile, have settled. Mr. Robichaud acknowledged most of the 1950s freeboard has already disappeared. Danika van Proosdij, a geography professor at Saint Mary’s University, examined dikes across the Bay of Fundy area a few years ago. She concluded most were not high enough to stop the floods from a one-in-10-year storm (the magnitude of a storm that has a 10-per-cent chance of occurring in any given year). To put that in perspective, many port cities defend themselves to the standard of a one-in-100-year flood, and many heavily populated areas lean toward a more conservative one-in-500-year flood. The Dutch, the planet’s most prolific and experienced dike-builders, adopted a one-in-4,000-year standard for Delta Works, a massive array of dikes, dams, sluices and other barriers. David Lieske, a geography professor at Sackville’s Mount Allison University, has also studied the situation and arrived at similar findings. In a 2011 report, he determined a one-in-10-year flood could inundate one-fifth of Sackville, affecting 156 buildings and more than 1,000 parcels of land. “Clearly, the Tantramar region is at immediate risk of a major flood event,” he wrote. Sackville's picturesque downtown, steps from flood-prone Lorne Street. Most Sackville residents live kilometres away from the dikes and rarely see them, but various education campaigns over the past decade have raised awareness of their importance considerably. It’s only a matter of time before the wrong storm blows in from the wrong direction at the wrong moment. “When we do have a large storm surge event similar to the Saxby Gale, all of these [dikeland] communities are going to be at significant risk,” Prof. Van Proosdij warned. And that will become increasingly probable as the pace of sea-level rise accelerates. Although most Sackville residents live kilometres away from the dikes and rarely see them, a decade-long education campaign has brought this problem into focus. Government, academics and local activists have studied how a changing climate influences local flooding risk. They produced reports and held community meetings. The town updated its flood maps, took an inventory of privately owned flat-bottomed boats to enable future evacuation efforts and modified zoning bylaws to discourage development in low-lying areas. “There’s a lot of restrictions now” for developments in flood-prone areas, said Mr. Acton, the town engineer. If dikes are to continue protecting the community, they will have to be raised −about 1.5 meters above current levels, by Mr. Robichaud’s estimate. But simply piling new material atop existing dikes is not an option: they are already at or near their physical limits. Once again, governments must consider building a new dike network, at great expense. After securing $403,000 from the federal National Disaster Mitigation Program, the governments of New Brunswick and Nova Scotia hired Amec Foster Wheeler, an engineering consultancy, to draw up new guidelines for dike design and construction throughout the Fundy region. The guidelines are intended to be flexible: dikes protecting residential neighborhoods will be beefier than those defending hay pastures. The consultants can look abroad for inspiration; the United Kingdom, the Netherlands and British Columbia have already incorporated climate change into their own standards. Although due in January, the guidelines are not yet finalized. Drawing up standards is one thing; adhering to them is another. Dikes built in B.C. to protect low-lying areas were made to 1970s standards, but the province revised its guidelines at least twice since then. In 2015, the province’s inspector of dikes hired Northwest Hydraulic Consultants to assess 500 kilometres across B.C.’s populous Lower Mainland. The consultants concluded that none fully met provincial standards; more alarmingly, 71 per cent were vulnerable to failure during flooding. 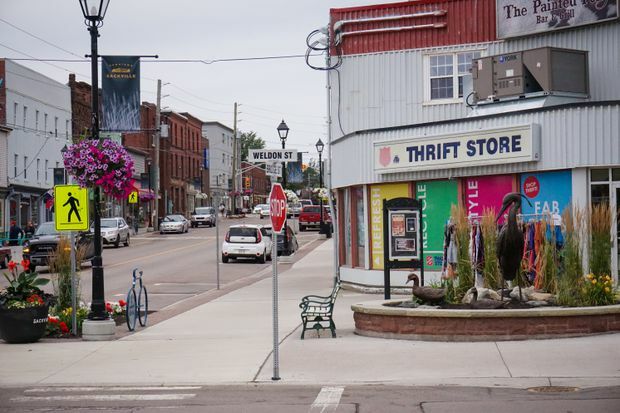 If Canada’s third-largest (and one of its wealthiest) cities is defended by decidedly second-rate dikes, Sackville’s residents might wonder how much political will or money stands ready to protect their small town. A couple of years ago, responsibility for maintaining New Brunswick’s existing infrastructure passed from the province’s agriculture department to its transportation and infrastructure department. The transportation department increased Mr. Robichaud’s annual maintenance budget to $550,000 − an improvement, but inadequate for building massive new infrastructure. Cost-benefit analysis may dictate that small, fallow coastal land tracts be abandoned. Prof. Van Proosdij said this has already become apparent in Nova Scotia, where the provincial agriculture department remains responsible for dike maintenance. “They actually have to choose where they’re going to raise the dikes and where they’re going to have to let them go,” she said. Prof. Lieske said Sackville must stop relying exclusively on what he called “the old engineering solutions.” It’s time to provide incentives for businesses and homeowners in low-lying areas to move onto higher ground, he suggested. 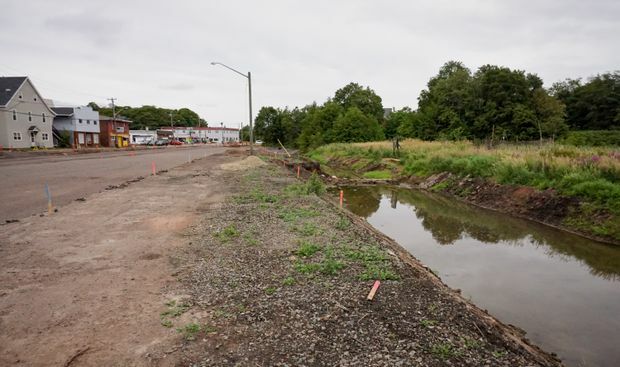 “We should create a new town centre or commercial area higher up, further west.” Low-lying areas such as Lorne Street should be converted back into wetlands. Editor’s note: Vancouver is Canada third-largest city, not its second, as an earlier version of this story suggested.